Human rights apply universally and it is the responsibility of governments to deliver and protect these rights. The right to breastfeed is seen as applying to the mother/child dyad. In other words, the mother and child as a unit have a right to breastfeed. It is not the unconditional right of the child to breastfeed, or that would oblige the mother to breastfeed regardless of her own situation. The right to breastfeed means that no outside party has the right to interfere with the relationship between the mother and child. "The principles are based on the concept that mothers should not be legally obligated to breastfeed, but rather they should be supported in making their own informed choices as to how to feed their infants." Protecting the right to breastfeed does not force mothers to continue breastfeeding if they want to stop. We have the right to free speech, but that does not mean we are forced to give an opinion on every subject under the sun; if we want to speak, that right is protected. In the UK, 90% of women who stop breastfeeding before six weeks do so before they wish to (Bolling et al, 2007 cited in UNICEF, 2012 - full Infant Feeding Survey details available at http://www.ic.nhs.uk/pubs/ifs2005). If the Government had protected the right to breastfeed, might the situation have been different? Speaking at the Conference, Miriam Labbok suggested that instead of talking of "protecting, promoting and supporting" breastfeeding, we could speak of "empowering, inspiring and counselling" mothers and the wider public with regard to breastfeeding. "A woman shall be provided with the right to one or more daily breaks or a daily reduction of hours of work to breastfeed her child... These breaks or the reduction of daily hours of work shall be counted as working time and remunerated accordingly." Not all countries have ratified the Convention - click here for those that have. The UK has not yet done so. There are many other areas where the right to breastfeed may be undermined and action should be taken. For example, in the UK mothers are sometimes abused for breastfeeding in public and the Government has acted by protecting the right for the mother/child dyad to feed in public in legislation. "right of the child to the enjoyment of the highest attainable standard of health... States Parties shall pursue full implementation of this right and, in particular, shall take appropriate measures... To ensure that all segments of society, in particular parents and children, are informed, have access to education and are supported in the use of basic knowledge of child health and nutrition, the advantages of breastfeeding..."
The aim of this Code is to contribute to the provision of safe and adequate nutrition for infants, by the protection and promotion of breastfeeding, and by ensuring the proper use of breastmilk substitutes, when these are necessary, on the basis of adequate information and through appropriate marketing and distribution. Note that the Code also aims to protect mothers who use breastmilk substitutes, who also have a right to accurate, independent information. Its provisions prohibit companies from advertising and seeking direct and indirect contact with pregnant women and the mothers of infants and young children. 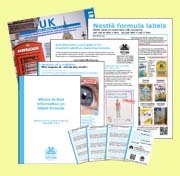 Companies are required to label products correctly and are limited to providing scientific and factual information to health workers, who are responsible for advising parents and carers. The Committee on the Rights of the Child now routinely looks at how governments have implemented the International Code and Resolutions when assessing their progress in complying with the Convention. It has twice called on the UK Government to implement these minimum standards in national measures, but the calls have so far gone unheeded. The Committee commented in 2008, "it is concerned that implementation of the International Code of Marketing of Breastmilk Substitutes continues to be inadequate and that aggressive promotion of breastmilk substitutes remains common". To promote breastfeeding and inspire mothers and their families may require investment in social marketing. In the UK, the coalition government scrapped the Infant Feeding Coordinator posts at the Department of Health, even though these posts are called for in the Global Strategy on Infant and Young Child Feeding. It is also short sighted if the intention is to save money. UNICEF UK issued a report this year on the unnecessary illness that could be prevented and costs saved if breastfeeding rates increased, if the mothers who stopped breastfeeding earlier than they wanted were able to continue for longer. The theme of the World Breastfeeding Conference was "Mom-made, not man-made". Perhaps "Mum-made, not manufactured" works better in our culture and helps us to highlight that the European Union prioritises trade and growth over health. So we see the Irish Government's Enterprise Ireland and Danone announcing investment of €50 million in a baby milk factory to boost the economy by exporting formula around the world. According to Enterprise Ireland "98% of the output from [the] Macroom [facility] will be exported and commercialized in more than 60 countries worldwide". This will inevitably displace breastfeeding in other countries as well as its own. To benefit its economy, the Irish Government could instead invest in mothers, the "real milk" producers, in a country where less than half (47%) of mothers are breastfeeding on discharge from maternity services (NPRS, 2008 cited by the Health Service Executive). In the Philippines, Nestlé is leading an industry effort to replace strong marketing regulations with a new weak law (I was honoured to share a platform with campaigners from the Philippines at the conference, pictured above) and the Department of Trade and Industry has written to Members of Congress calling on them to back the draft bill because otherwise US$400 million of investment could be cancelled by the corporations and because of the revenue infant formula sales generate for the Government. The Philippines Department of Health, UNICEF and WHO have said in a statement that the draft bill: "aims to support multinational companies while damaging the Filipino society: families, the mothers and children." To support breastfeeding requires provision of health care services, a supportive environment and counselling services, particularly in countries where breastfeeding is not entrenched and visible. "There is increasing recognition at the international level that good nutritional status is an outcome that depends not only on good food but also on good health services and good care. Health services consist of a broad range of measures for the prevention and control of disease, including the maintenance of a healthy environment." In the UK we have the National Health Service, free at the point of use, and an increasing number of hospitals are entering the UNICEF Baby Friendly Initiative, which aims to ensure support is provided to pregnant women and mothers in hospital and in the community. However, there are growing concerns about the way health workers are being targeted in the UK and other countries by baby milk companies, including through funding training and other events. Mother support groups provide counselling services in the UK and the Department of Health does provide a grant towards the National Breastfeeding Helpline operated by a coalition of them. This is one example of the Government acting on its human rights obligations. However, a coherent approach is needed as the failure to adequately regulate the baby food industry means companies encourage pregnant women and mothers to contact company-branded telephone "carelines" for support on infant feeding and to sign up to their mother and baby clubs for information. There is an intrinsic conflict of interest in baby milk companies with products to sell making direct and indirect contact with pregnant women and mothers, and this is prohibited by the Code. The fact this is a marketing strategy was demonstrated last month when Baby Milk Action won a case against Pfizer/Wyeth before the Advertising Standards Authority (ASA) over its illegal advertising of infant formula when ostensibly providing breastfeeding support. A human rights approach requires action on many fronts. It helps us to think coherently and logically about what is required to protect and deliver the rights in question. In the cultural context of the UK and Europe we need to articulate that protecting the mother/child dyad's right to breastfeed is to provide space for all mothers to breastfeed, particularly those mothers who say they want to breastfeed for longer, but who experience problems that could not be overcome under the current circumstances. At the same time we should understand that not everyone has to exercise the rights they hold. We need to persuade policy makers to act, because it is governments who are responsible for protecting and delivering rights. We need to persuade governments to invest in mothers, the "real milk" producers, rather than factories built not to meet existing requirements, but to export baby milk around the world and to create new consumers and markets for economic reasons. Danone aims to supply 20% of the world's infant formula from Ireland, supplanting the most locally produced and consumed food there is at great environmental and health cost. We sometimes speak of breastfeeding being free and perhaps this led to it being undervalued by policy makers. 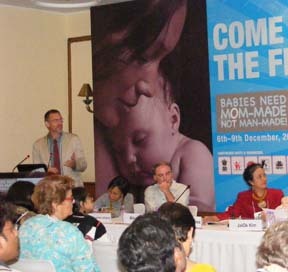 But as Anwar Fazal, Chairperson Emeritus of the World Alliance for Breastfeeding Action (WABA), told the Conference in his inaugural address describing the five principles of breastfeeding: it provides medicine, it provides nutrition, it is sustainable, it protects the environment and it plays a special role in the mother/child bond. For these benefits to be enjoyed as widely and as fully as possible, governments need to invest political effort and funding to meet their obligation to protect the right to breastfeed. At the conference there were many inspiring stories of governments that have and are taking action and of the situation in countries where breastfeeding cultures continue to exist or have been recovered. For those of us living in cultures where many mothers are unable to breastfeed as they would wish, this provides welcome reassurance that a new reality is within our grasp if we reach for it. "Food is a Human Right," in Richard Pierre Claude and Burns H. Weston, Human Rights in the World Community: Issues and Action. Third Edition. Philadelphia: University of Pennsylvania Press, 2006, pp. 191-201. Also see Global Obligations for the Right to Food, edited by Professor George Kent, with a chapter on Holding Corporations Accountable by myself (Mike Brady) and a chapter on International Legal Obligations for Infants' Right to Food by Dr Arun Gupta, organiser of the World Breastfeeding Conference. Available in Baby Milk Action's online Virtual Shop. When will countries value breastmilk as a valuable natural resource that saves government money? Because national budgets are deemed succesful or not by the bottom line couldn't we encourage governments to put a line in their budget plans for the amount saved as a result of the numbers of babies breastfed? There are budget entries for making money through exports such as baby milk formula but the health costs of formula fed babies will be huge and needs to appear in the budgets as a cost. Who is campaigning for these sorts of changes at the national budgeting level?